One thing that most of my generation of Iranians learned from the 1979 revolution was, not to chant death to something, if we did't have something better to replace it with. It took me a few seconds to try to understand what the banner was supposed to mean but of course they meant they were expressing solidarity with Anti and not Unti Capitalist Movement as the writing on the banner suggests. 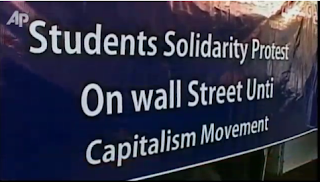 Still we should be pleased that it didn't say 'Student Solidarity Protest on Wall Street Auntie Capitalism Movement'. Not the brightest kids on the block, the Baseej students of course, for if they had a two digit IQ, they wouldn't be in the Baseej militia in the first place. Yep, the usual rent a crowd of Khamanei muppets! We all know that any proper University protests in Iran are either banned or deliberately not unreported! Still, it will BE Iran's corrupt economy which will ultimately spell trouble for the IRI. I.e. Growing inflation and unemployment - The 3 billion embezzlement - The rank and file already lining up to blame each other over fraud and mismanagement. With Lybia now also liberated, soon the glaring spotlght on Iran's belligerent and isolationist policies, will not only scorch the robes of the rheocratic tyranny - but hopefully and at last, send the whole rotten barrel up in flames! 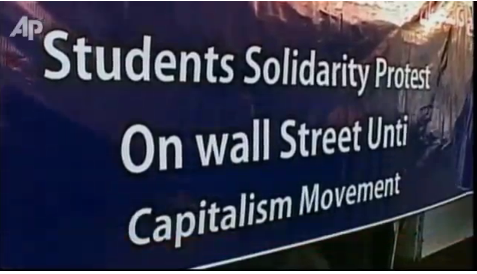 So you say that only those with good command of the English language have the right to protest against Wall Street?